‘Twas the month before Christmas, and Bill O’Reilly launched his usual jihad against the purported “War on Christmas.” It drew the predictable counterblasts from the Left, and I just happened to run across one that appeared back on December 4 on Huffpo, entitled “A War on Reason, Not on Christmas.” I must admit I find the “War on Christmas” schtick tiresome. Conservatives rightly point to the assorted liberal cults of victimization as so much pious grandstanding. It would be nice if they practiced what they preach and refrained from concocting similar cults of their own. Be that as it may, I found the article in question somewhat more unctuous and self-righteous than usual, and left a comment to that effect. It was immediately deleted. Before imploding in the face of his sordid extramarital trysts, presidential candidate John Edwards based his campaign on the idea of two Americas, one rich the other poor. He was right about the idea that American is divided, but wrong about the nature of the division. The deeper and more important split is defined by religiosity, not riches. The conflict between these two world views is made apparent in the details of our voting booth preferences. Religiosity alone is the most important, obvious and conclusive factor in determining voter behavior. Simply put, church goers tend to vote Republican. Those who instead go the hardware store on Sunday vote Democrat by wide margins. Those who accept the idea of god tend to divide the world into believers and atheists. Yet that is incorrect. Atheist means “without god” and one cannot be without something that does not exist. Atheism is really a pejorative term that defines one world view as the negative of another, as something not what something else is. Traits that we view as moral are deeply embedded in the human psyche. Honesty, fidelity, trustworthiness, kindness to others and reciprocity are primeval characteristics that helped our ancestors survive. In a world of dangerous predators, early man could thrive only in cooperative groups. Good behavior strengthened the tribal bonds that were essential to survival. What we now call morality is really a suite of behaviors favored by natural selection in an animal weak alone but strong in numbers. Morality is a biological necessity and a consequence of human development, not a gift from god. Exactly! Now, as I’ve often pointed out to my readers, if morality really is the expression of evolved traits as the author suggests, it exists because it happened to enhance the chances that certain genes we carry would survive and reproduce in the environment in which they happened to appear. There is no conceivable way in which they could somehow acquire the magic quality of corresponding to some “real, objective” morality in the sky. There is no way in which they could assume a “purpose” attributed to them by anyone, whether on the left or the right of the political spectrum. Finally, there is no way in which they could acquire the independent legitimacy to dictate to anyone the things they “really” ought or ought not to do. So much is perfectly obvious. Assuming one really is “reasonable,” it follows immediately from what the author of the article says about the evolved origins of morality above. That, of course, is not how the Left is spinning the narrative these days. The species-centric arrogance of religion cultivates a dangerous attitude about our relationship with the environment and the resources that sustain us. Humanists tend to view sustainability as a moral imperative while theists often view environmental concerns as liberal interference with god’s will. Conservative resistance to accepting the reality of climate change is just one example, and another point at which religious and secular morality diverge, as the world swelters. It’s wonderful, really. The Left has always been addicted to moralistic posing, and now they don’t have to drop the charade! Now they can be as self-righteous as ever, as devotees of this secular version of morality that has miraculously acquired the power to become a thing-in-itself, presumably drifting up there in the clouds somewhere beyond the profane ken of the unenlightened Christians. As it happens, at the moment my neighbors are largely Mormon, and I must say their dogmas appear to me to be paragons of “reason” compared to this secular version of morality in the sky. There is no war on Christmas; the idea is absurd at every level. Those who object to being forced to celebrate another’s religion are drowning in Christmas in a sea of Christianity dominating all aspects of social life. An 80 percent majority can claim victimhood only with an extraordinary flight from reality. You are probably being deafened by a rendition of Jingle Bells right now. No, there is no war on Christmas, but make no mistake: the Christian right is waging a war against reason. And they are winning. O’Reilly is riding the gale force winds of crazy, and his sails are full. This book is an attempt to understand morality from the ground up. It’s about understanding what morality is, how it got here, and how it’s implemented in our brains. It’s about understanding the deep structure of moral problems as well as the differences between the problems that our brains were designed to solve and the distinctively modern problems we face today. Finally, it’s about taking this new understanding of morality and turning it into a universal moral philosophy that members of all human tribes can share. Our moral brains did not evolve for cooperation between groups (at least not all groups). How do we know this? Why couldn’t morality have evolved to promote cooperation in a more general way? Because universal cooperation is inconsistent with the principles governing evolution by natural selection. Morality did not evolve to promote universal cooperation. On the contrary, it evolved as a device for successful intergroup competition. In other words, morality evolved to avert the Tragedy of the Commons, but it did not evolve to avert the Tragedy of Commonsense Morality. …the Tragedy of Commonsense Morality is a tragedy of moral inflexibility. There is strife on the new pastures not because herders are hopelessly selfish, immoral, or amoral, but because they cannot step outside their respective moral perspectives. How should they think? The answer is now obvious: They should shift into manual mode. First, the human manual mode is, by nature, a cost-benefit reasoning system that aims for optimal consequences. Second, the human manual mode is susceptible to the ideal of impartiality. And, I submit, this susceptibility is not tribe-specific. Members of any tribe can get the idea behind the Golden Rule. Put these two things together and we get manual modes that aspire, however imperfectly, to produce consequences that are optimal from an impartial perspective, giving equal weight to all people. Utilitarianism is a very egalitarian philosophy, asking the haves to do a lot for the have-nots. Were you to wake up tomorrow as a born-again utilitarian, the biggest change in your life would be your newfound devotion to helping unfortunate others. We can excuse Mill for promoting such a philosophy. He wrote before his philosophy could be informed by work of Darwin. As a result, even though he was aware of contemporary theories claiming an innate basis to moral behavior, he rejected them. In other words, he was a Blank Slater, though certainly not in the same sense as the ideologically motivated Blank Slaters who came after him, or the religiously motivated Blank Slaters, like Locke, who came before him. As a result, he believed that the human mind could adopt virtually any morality, and concluded that the best one would be that which was also most useful. Clearly, he realized that, if morality were innate, it would have profound implications for his theories. As I have written elsewhere, I think it highly probable that, if he had lived in our times, he would have put two and two together and rejected utilitarianism. We can, for example, donate money to faraway strangers without expecting anything in return. From a biological point of view, this is just a backfiring glitch, much like the invention of birth control. But from our point of view as moral beings who can kick away the evolutionary ladder, it may be exactly what we want. Morality is more than what it evolved to be. (referring to someone in a fine Italian suit that will be ruined if he wades into a pond to save a drowning child) Is it morally acceptable to let this child drown in order to save your suit? Clearly not, we say. That would be morally monstrous. Happiness is the ur-value, the Higgs boson of normativity, the value that gives other values their value. We’ll dispense with the not especially moral goal of spreading genes and focus instead on the more proximate goal of cooperation. In other words, dangling before Greene’s imagination is a Morality that has nothing to do with the reasons that led to the evolution of moral behavior to begin with. I have different goals. I don’t hide them behind a smokescreen of “meta-morality.” They are, first, to promote the survival of my own genes, second, to promote the survival of my species, and third, to promote the survival of terrestrial life. I do not consider my conscious mind anything but a transitory, evolved aspect of my phenotype, but to that mind there is something sublime and majestic in being the link in a chain of life that has existed for billions of years. The idea that I will be the last link in that chain is repugnant to me. Serving as a “happiness pump” for a huge colony of happy ants that has no perceptible reason for existing except to “flourish” and be “happy” is completely repugnant to me. History offers no shortage of grand utopian visions gone bad, including the rise and (nearly complete) fall of communism during the twentieth century. Communists such as Stalin and Mao justified thousands of murders, millions more deaths from starvation, and repressive totalitarian governments in the name of the “greater good.” Shouldn’t we be very wary of people with big plans who say that it’s all for the greater good? Yes, we should. Especially when those big plans call for big sacrifices. And especially, especially when the people making the sacrifices (or being sacrificed!) are not the ones making the big plans. But this wariness is perfectly pragmatic, utilitarian wariness. What we’re talking about here is avoiding bad consequences. Aiming for the greater good does not mean blindly following any charismatic leader who says that it’s all for the greater good. That’s a recipe for disaster. So Greene thinks that the whole Communist debacle, with its gestation period of well over a century, during which time its development was carried forward by a host of convinced theorists, many of whom were neither charismatic themselves nor particularly attracted to charismatic leaders, could have easily been avoided if its adepts had just been “pragmatic,” and had been more circumspect in their choice of leaders? Sorry, but I think a better way to avoid such catastrophes in the future would be to stop cobbling together new “meta-moralities” altogether. We cannot dispense with morality, at least at the level of individual interactions. We’re not smart enough to do without it. That said, we can at least attempt to understand its evolutionary roots and the reasons for its existence, and, in the realization that the traits we associate with moral behavior evolved at times utterly unlike the present, do our best to keep our moral emotions from blowing up in our faces. Greene’s utilitarianism will never be a miraculous solution to the “Tragedy of Commonsense Morality.” There will always be ingroups and outgroups, and they will always be hostile to each other, manual mode or no manual mode. What could possibly be more manifest than the furious hostility of Greene’s own liberal tribe to their conservation outgroup? If we are to survive, we must learn to manage this hostility, and creating yet another new moral system seems to me an extremely unpromising approach to the problem. Money justly due from the people, is their creditor’s money, and no longer the money of the people, who, if they withhold it, should be compelled to pay by some law. All property, indeed, except the savage’s temporary cabin, his bow, his matchuat, and other little acquisitions absolutely necessary for his subsistence, seems to me to be the creature of public convention. Hence the public has the right of regulating descents, and all other conveyances of property, and even of limiting the quantity and uses of it. All the property that is necessary to a man for the conservation of the individual, and the propagation of the species, is his natural right, which none can justly deprive him of; but all property superfluous to such purposes, is the property of the public, who, by their laws, have created it, and who may, therefore, by other laws, dispose of it whenever the welfare of the public shall desire such a disposition. He that does not like civil society on these terms, let him retire, and live among the savages! He can have right to the benefits of society, who will not pay his club towards the support of it. Of course, in the meantime we’ve carried out numerous repeatable experiments that seem to demonstrate quite conclusively that government policies intended to implement such ideas are undesirable because they don’t work. In the end, they don’t serve the “welfare of the public” because they fail to take the behavioral idiosyncracies of our species into account. Does that mean that Franklin was stupid? Far from it. As his experiments with electricity demonstrate, he had the mind of a true scientist. The comments in his autobiography about influencing others to accept new ideas might have been lifted from a 21st century textbook on moral psychology. More importantly, his combination of brilliance and common sense were an invaluable guide and support to our Republic in its infancy. The point is that even the most brilliant human beings can easily delude themselves into believing things that are not true, and even things that in the light of later experience seem palpably silly. We are not nearly as smart as we think we are. The next time some wildly popular messianic scheme for saving the world inflicts itself on mankind, it’s “enlightened” proponents would do well to keep that in mind. As for old Ben, the quote above was more the product of exasperation than sober thought. Robert Morris was the great financier of our Revolution. Read the fine biography of him by Charles Rappleye, and you’re bound to wonder how we ever beat the British. Morris used all of his great intelligence, experience, and personal credit to somehow keep Washington’s army fed and clothed, in spite of the fact that the states whose independence he was fighting to win refused to be taxed. His reward for all his tireless work was to be viciously vilified by pathologically pious super-revolutionaries like Arthur Lee and his brothers, men who deemed themselves great defenders of liberty, but who actually provided more “aid and comfort” to the British than Benedict Arnold ever dreamed of. 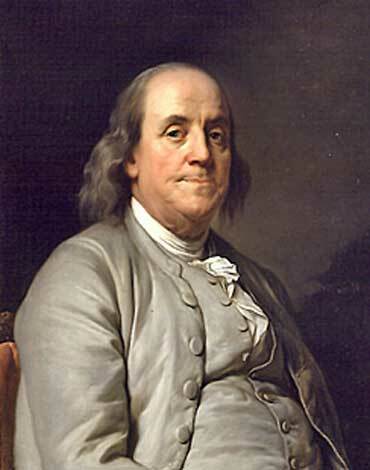 Franklin was well aware of their mendacious attacks on Morris, and their bitter resistance to any attempt to create an effective national government capable of collecting the taxes necessary to support the war effort at a time when the paper money we had relied on in the early years of the Revolution had become nearly worthless. Their type should be familiar, as there are still ample examples among us today. The fact that they provoked such a cri de Couer from Franklin should come as no surprise. A number of papers have turned up in the scientific literature lately concerning innate aspects of human mental processes that can impair our ability to discover truth, such as this one by Hugo Mercier and Dan Sperber. Not unpredictably, the human mental processes described in these papers have been conflated with “reason,” spawning a meme about the limits thereof. A representative artifact of the phenomena recently appeared in Newsweek, entitled “Limits of Reason.” Expect more of the same. No matter that there are obvious differences between “reason” defined as a systematic method for discovering truth and “reason” defined as a mental process specific to human beings, the notion that there are “limits to reason” is so seductive that many people are unlikely to notice. For example, blind religious faith becomes more justifiable if “reason” is useless. Moral biases of every stripe can be fobbed off as “legitimate” if the power of “reason” to challenge them is denied. The “Age of Reason” itself can be dismissed with a hand wave as an effort in futility. Well, memes eventually run their course, and I doubt this one will be any different. Meanwhile, I will continue to favor reason as the most effective, albeit occasionally flawed, means of discovering truth. So far no one has come up with anything that is demonstrably better.